If you have already installed the latest Android Oreo 8.0 stable build mobile operating system officially released by Google on your Google Pixel, Google Pixel XL, Google Pixel C, Huawei Nexus 6P, and LG Nexus 5X smartphone and tablet devices, then you can easily Install TWRP Custom Recovery on Google Pixel and Nexus mobile phones to Flash Custom ROMs and can also Root Android 8.0 Oreo Firmware with SuperSU to gain deep root access for unlimited customization, personalization and installation of Root Apps from Google Play Store. Follow our below step-by-step guide and detailed tutorial to perform these tasks without any issue. Before you move forward, you need to ensure that your device Bootloader is Unlocked; you have properly Installed Android USB Drivers of your device on your Windows and macOS systems; you have Enabled USB Debugging option under Settings App; you must get Full Data Backup of your device on your PCs/Laptop, because this will wipe off all your data and apps. We at (TechGlobeX.net) won't be responsible for any damage, brick, and loss of your device at any stage. So continue this at your own risk! How to Install TWRP on Pixel and Nexus Devices and Root Android Oreo 8.0 with SuperSU? Step #1: Download and Install ADB/Fastboot platform tools separate package extracted from Android SDK on your Windows, macOS, and Linux systems. Make sure to extract or unzip the file on your PC to get a working folder. Step #2: Download SuperSU v2.82-SR3 and save it on your Computer. Step #3: Activate USB Debugging mode under Developer Options from Settings App on your Android device. Step #4: Now Connect your device with your PC via data cable, and Copy/Paste SuperSU v2.82-SR3 zip file on your Android device SD Card or Internal Storage root location. Step #5: Download the latest TWRP Custom Recovery for your device via below download links and Copy/Paste this to your PC's X:\platform-tools-latest-windows\platform-tools (STEP #1) root directory folder. Step #6: Power-Off Your Android Phone. Step #7: Now put your device into Bootloader/Fastboot Mode by pressing Volume Down + Power Key/Lock Key for few seconds till you get Fastboot Text on your screen. Step #8: After that, Go to X:\platform-tools-latest-windows\platform-tools (STEP #1) directory folder again and open Command Prompt by pressing Keyboard Shift Key + Mouse Right-Click and Press Open Command Prompt. Step #10: After completion, Select RECOVERY on Fastboot Menu and Enter into Recovery Mode. Step #11: Now Click the Power Button and Select “Choose .ZIP from SD Card” option. Step #12: After that, Use device Volume Keys to navigate to SuperSU v2.82-SR3 zip file (STEP #4) and select it with device Power Button. Now confirm the installation on next screen. Your Root Installation process will begin here. Step #13: After installation completed, Navigate to “+++++Go Back” and Restart your device by Selecting “Reboot System Now” option from TWRP Recovery Menu. Congratulations!! 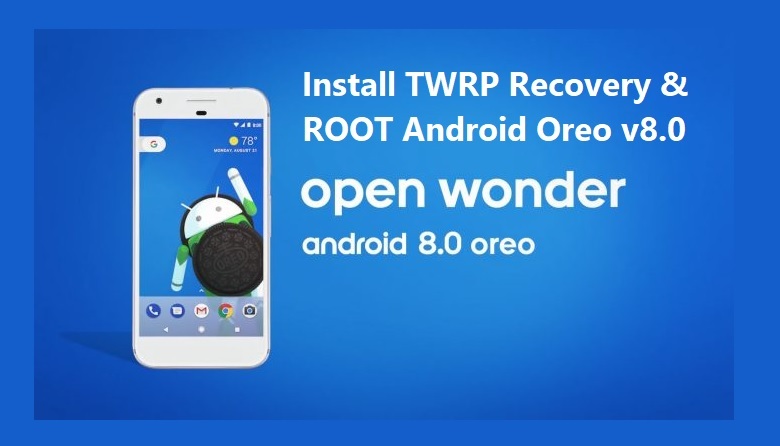 You have successfully Rooted Android Oreo 8.0 after Installing TWRP Custom Recovery on your Google Pixel, Google Pixel XL, Google Pixel C, Huawei Nexus 6P, and LG Nexus 5X smartphones or tablets.